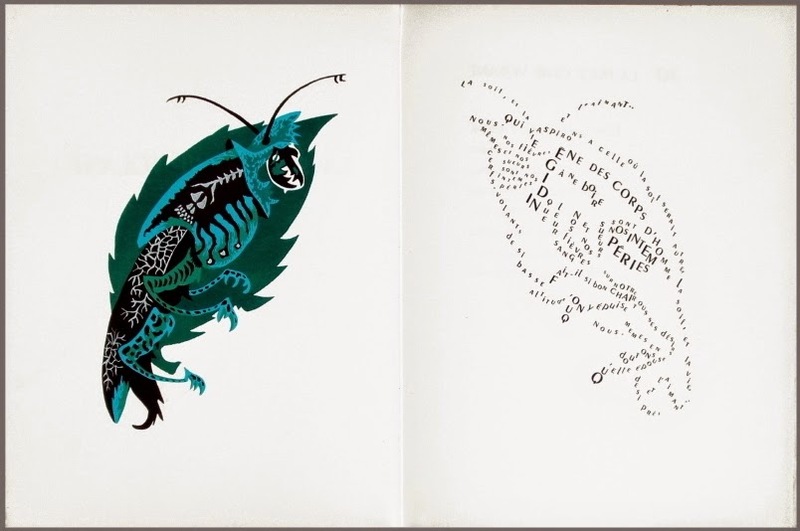 A mid-20th century collaboration between artists, poets and printers gave rise to a unique book of surrealistic creatures accompanied by complementary typographic art poems. 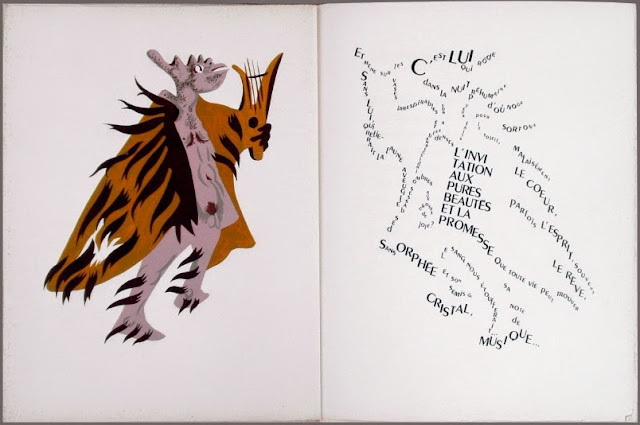 The original gouache designs of fabulous beasts were produced by Jean Lurçat, which inspired poems by Patrice de la Tour du Pin. 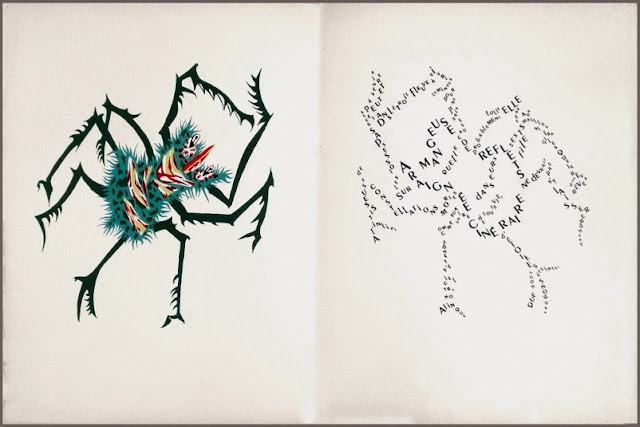 The sketches were rendered as lithographs by Vairel Edmond and the poems were turned into calligrams* by Jules-Dominique Morniroli. 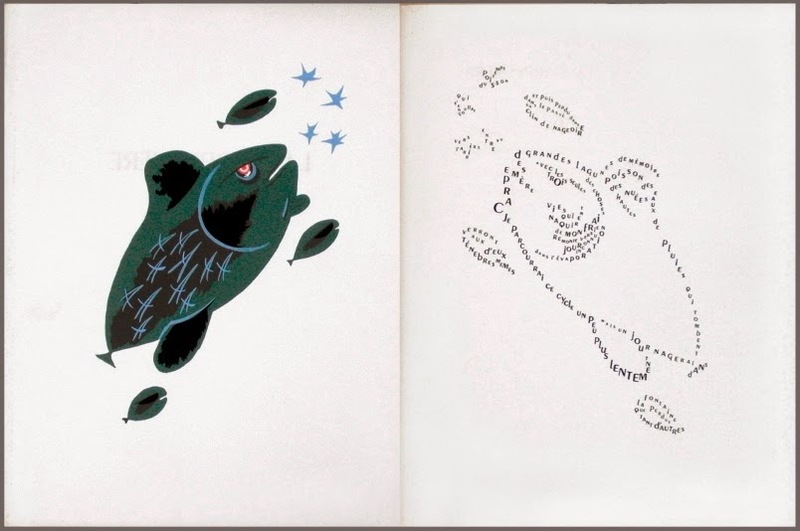 The book was printed/published in a limited edition by Maurice Darantiere at P. Gaudin in 1948. At least a couple of the participants in this project became friends while working for the French underground during World War 2. 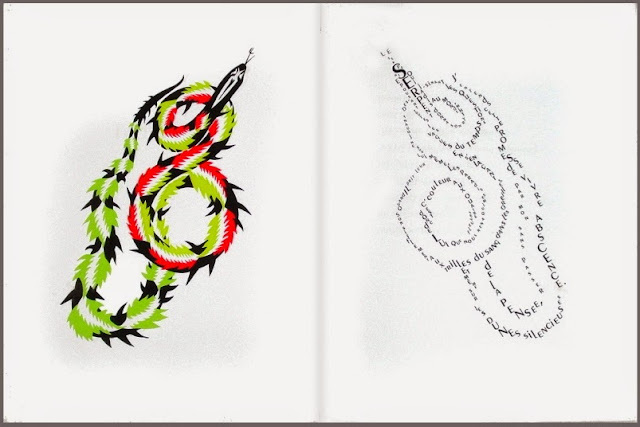 "A calligram is a poem, phrase, or word in which the typeface, calligraphy or handwriting is arranged in a way that creates a visual image." Previously: Zoomorphic Calligraphy || Hebrew Micrography. ne devrait pas s ‘y laisser prendre. could not be caught in them. "This book of poems with accompanying gouaches (opaque watercolors) and calligrams (figures made up of letters) about fantastic beasts and imaginary animals was bound by Thérèse Moncey. 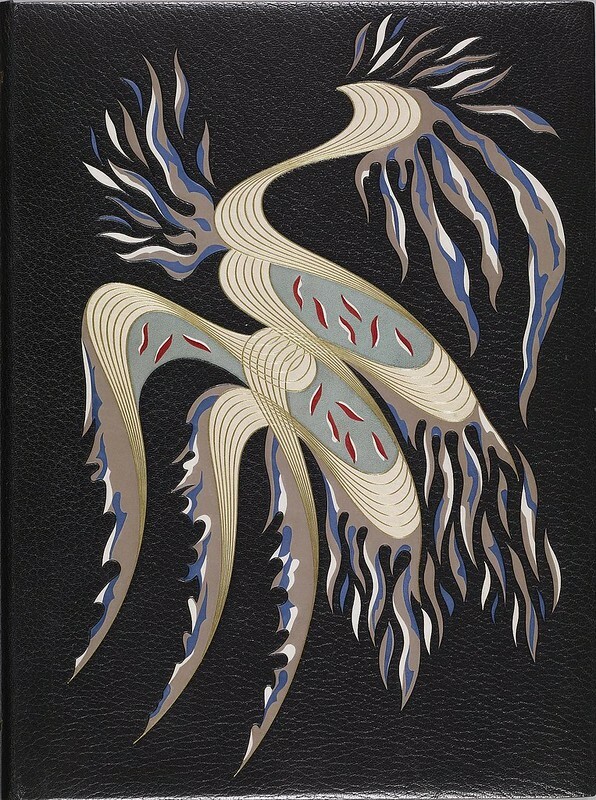 It features an abstract, birdlike form designed by the binder and won the French Grand Prix for Bookbinding in 1950." 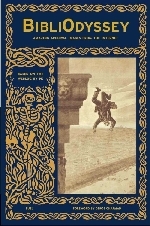 [source] The binding was made from calfskin, goatskin, and gold. With the Matters of Joy? J’entends cette promesse de vivre par mon absence. Thus, from it we are born again. Even on the silent dunes of Thought, it slides without a name. "Jean Lurçat (1892-1966) was a French Expressionist/Surrealist artist born in Vosges. He was exposed to art as a young boy when his parents introduced him to the founder of the Ecole Nancy, Victor Prouve. He traveled to Paris when he was 20, enrolling at the Ecole des Beaux-Arts and then the Academie Colarossi. 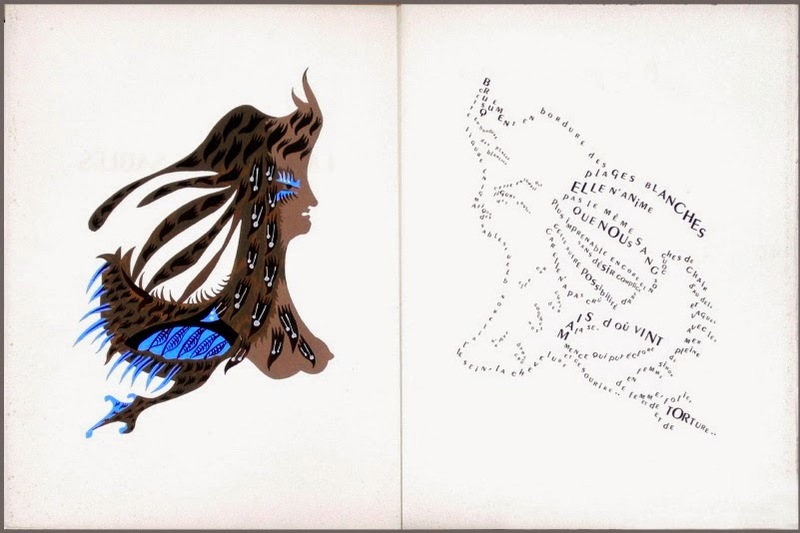 Throughout his career, Lurçat would form a style of his own, derived from his travels through the Mediterranean, North Africa and the Middle East. His unique style had a primitive, native art feel and was composed of symbols and hieroglyphic-like imagery. Within this style, he created ceramics, paintings, tapestry and a number of other art pieces. 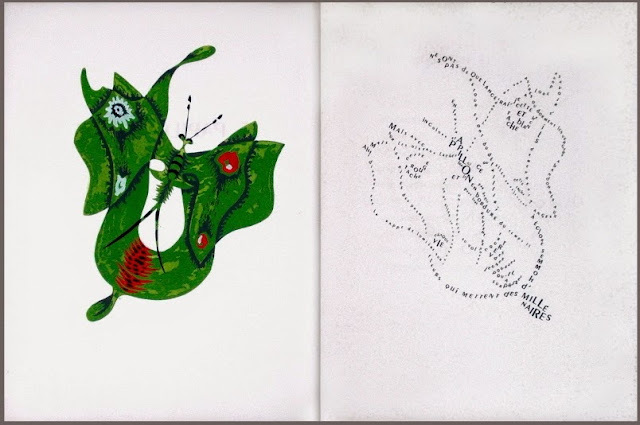 'Le Bestiaire Fabuleux' consists of 14 lithographs of Lurçat's abstracted figures, the majority (but not all!) of which have been posted above. To see any omissions, you will have to visit the source site. The images were uploaded in 2011 in celebration of the 100th anniversary of Patrice de la Tour du Pin's birth. It's a shame the images are only of a modest size, though the fabulous surreal animals mirrored by poetic calligrams make this book too unique a work to pass up for so minor a detraction. I saw no commentary about the poems' content and I decided to skip the opportunity to embarrass (like that would have been the first time) myself with poor-to-partial translation guesses. 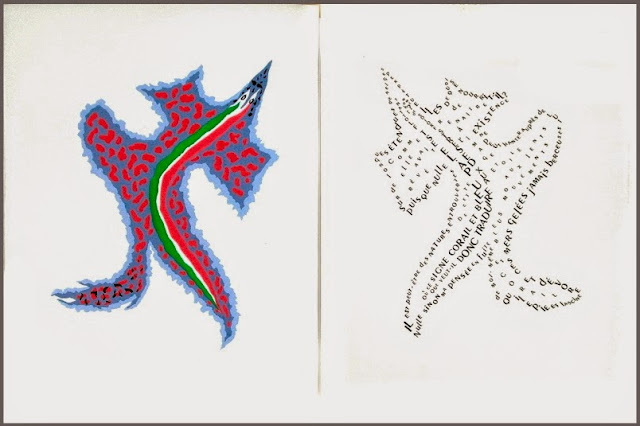 If anyone can work out the gist or full meaning of the calligrams, please leave a comment or send me an email (gmail peacay). An extensive chronology/biography of Lurçat. 'Chouette de Bonne Esperance' at the V&A (owl). Whitford Fine Art has a small bio and solo exhibition chronology. 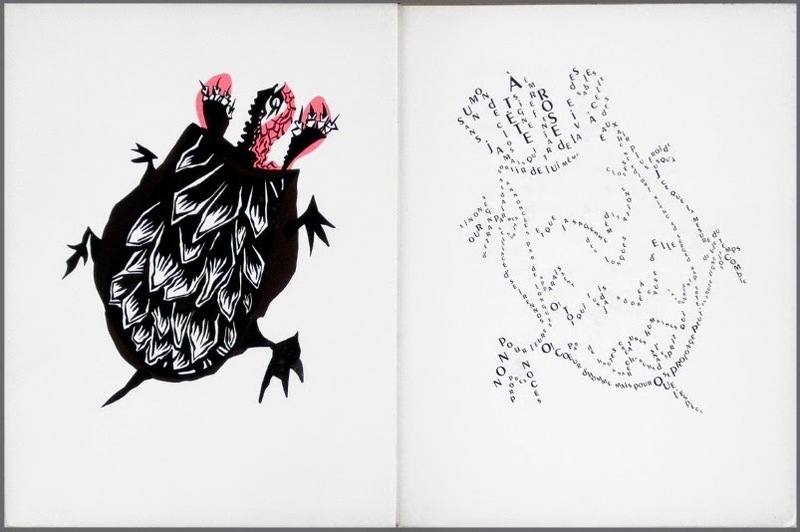 AbeBooks listing of Lurçat's bestiary for >£700. Books by or about Lurçat at Amazon. Bridgeman Art Library has quite a good sampling of Lurçat works. French cemetery site has a few pictures; Lurçat has a grave marking of an artist. Patrice de la Tour du Pin at Wikipedia.Fr.